At the age of 20, and already in a full-time profession, I decided I wanted a career change. Working in the marketing industry had always interested me, and was one of two career choices I had always considered. I opted for my first choice – journalism. My job as a local newspaper reporter did equip me with excellent content skills, but I still lacked the specific expertise, qualifications and experience that would allow me to jump straight into full-time marketing position. That’s when I considered becoming an apprentice. I stumbled upon a vacancy online for a Digital Marketing apprentice at Tillison Consulting – a digital marketing agency based in Portsmouth. 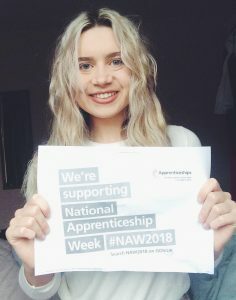 But the more I looked into the role, as well as researched apprenticeships in general, it sounded more and more like the perfect career opportunity for me. My experience as a digital marketing apprentice has been invaluable to me! I’ve learned so many new skills and because I was in the workplace all the time, I picked up so much more knowledge and experience than I would have done if I had to go to college. I wasn’t treated like an inexperienced apprentice either, but valued as a full-time member of staff. I was also given higher levels of responsibilities as my experience grew. Even so, that I managed to achieve two positional promotions whilst I was still an apprentice. I am now a full-time member of staff at Tillison. I’ve been promoted to Project Lead and have my own team and clients that I manage. I would have never gotten to the position I am in today without being an apprentice. You get to earn while you learn and gain real, on-the-job training whilst also achieving a qualification. It has set me up on the digital marketing career ladder! I’d tell anyone looking for a fresh start, especially those who are older, that it’s never too late to be an apprentice! Finding the right career path can be hard but an apprenticeship can lead the way!